All you need is to add references to installer's scripts, no hard-coding is necessarry! We provide many templates and examples, so your installer can be finished in few minutes! Plug-in for Microsoft Visual Studio, RAD Studio, IS Studio and Standalone application for fast creating Inno Setup scripts with custom design. This product use the same core as traditional Inno Setup installers - so there is no difference in writing scripts! Thanks to Pascal Scripting language it is easy to add custom wizard pages and elements to them (TextBoxes, CheckBoxes ...). Fully multilingual support (including RTL languages) in one installer. 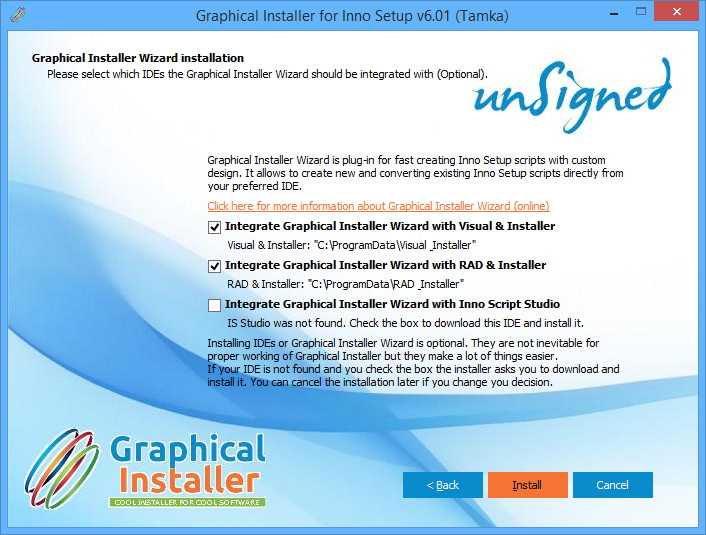 Modify only single line of script to completely change the design of your installer. For Inno Setup features visit Inno Setup website.